Annual bluegrass, known as Poa annua, is the most troublesome weed of turf systems, according to a recent Weed Science Society of America survey, and this weed has grown to epidemic proportions, causing severe economic losses. Dr. Bryan Unruh is a member of a team of 16 scientists from across 15 universities that are involved in a four-year, $5.7 million project to limit the impact of annual bluegrass in athletic, golf, lawn and sod turf. Funding is from a Specialty Crops Research Initiative Coordinated Agricultural Project grant from the U.S. Department of Agriculture-National Institute of Food and Agriculture. He needs to identify sites where he can collect annual bluegrass plants for evaluation as soon as possible. 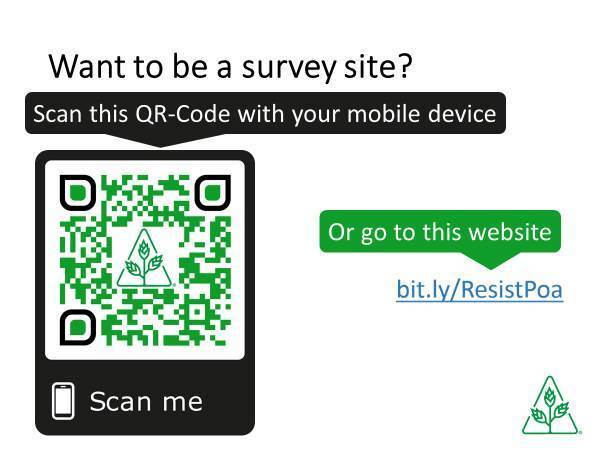 The link to the survey is: http://bit.ly/ResistPoa.